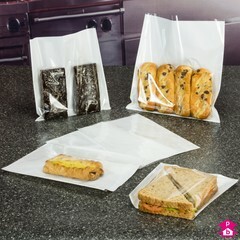 10% off front film bags, otherwise known as clear-faced bags or window-bags or film-front bags. 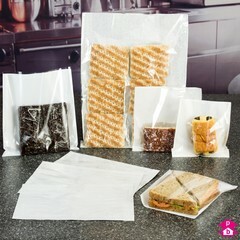 These are popular display bags used by a wide range of industries including bakeries, artisan markets and photographers. Front film bags have a clear polypropylene front and are backed with acid-free kraft paper so that the contents are protected but clearly visible. 8 Products. 10% off film-front window bags with a clear 20 micron polypropylene front and a white acid-free kraft paper back. Used extensively by bakeries and delicatessens. Great for doughnuts - Mmmmmmm! 4 Products. 10% off film-front window bags with a clear 20 micron polypropylene front and a pearl coloured backing. Perfect for pastries, breads, baked goods but also popular with artists and markets.